I’ve been hearing about the benefits of tea rinses for quite some time so I thought I’d actually try one. The heat and the caffeine from the tea are supposed to stimulate hair growth by opening your hair’s cuticles (allowing nutrients to seep in better) and increasing circulation to the scalp. 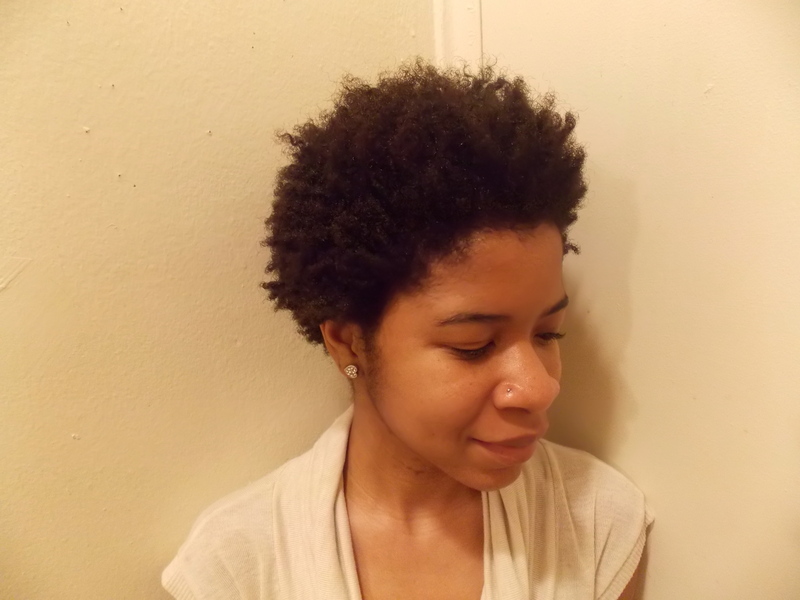 Now I BC’d (big chopped) my hair on New Years Day 2013 after transitioning for 6 months. I must say that although I’ve seen maybe 1-1.5 inches of growth, it’s moving too slow for me. It’s been almost 3 months. I deep condition regularly, co-wash my hair and a spritzer bottle is my best friend honey, but it’s just not moving fast enough. I know the culprit is lack of scalp stimulation. So, I’ll take you through the steps if you’d like to try this as well, and give you my honest opinion on the results of the tea rinse. Hot water not pictured here. – Tea. I chose Lipton black tea, but you could also use green tea for this. – A mug. Used to steep the tea. You can also just steep the tea in the tea pot. – An applicator. This is really important. Since the target of the treatment is the scalp, you want to use an applicator so most of the tea is applied directly onto the scalp. – Hot water. Not pictured. This is for the sole purpose of steeping the tea. Please remember to let the tea cool to a warm state before applying to the scalp. You don’t want to burn your head. 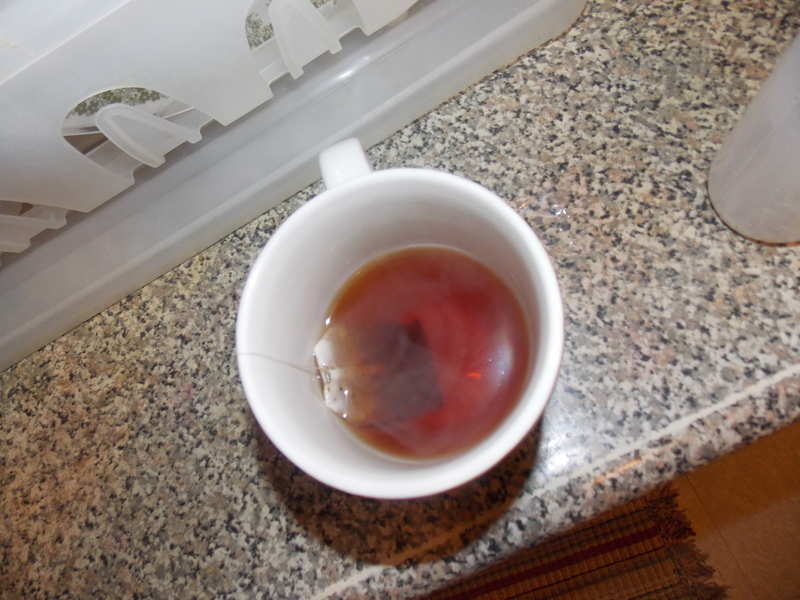 After boiling your water, get your tea bag and pour the water into your vessel of choice. Give your tea about 2 minutes to steep. This would also be a great time to add any other things to the liquid for your treatment. Adding essential oils like lavender would boost circulation. 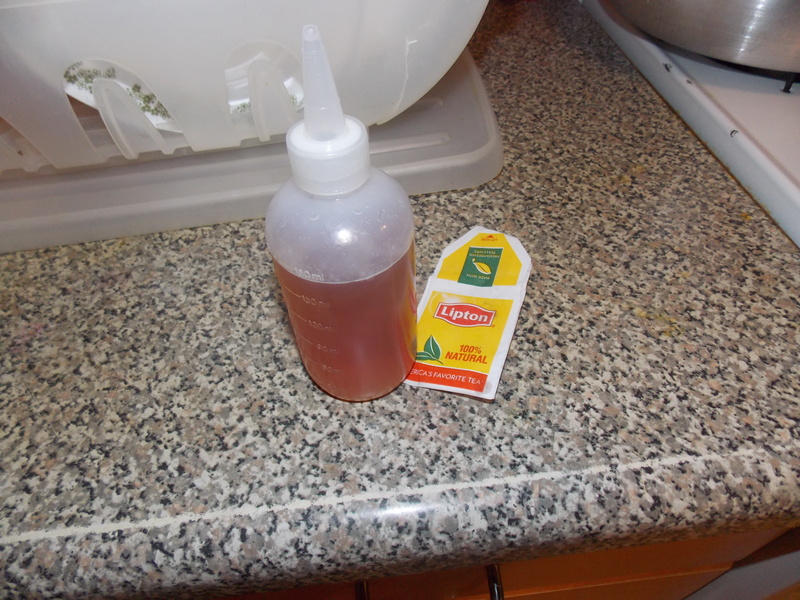 Adding honey will help the hair to retain moisture. Remember to let the tea cool, or if you’re impatient like me, add a little cool water to bring down the temperature of the mixture. 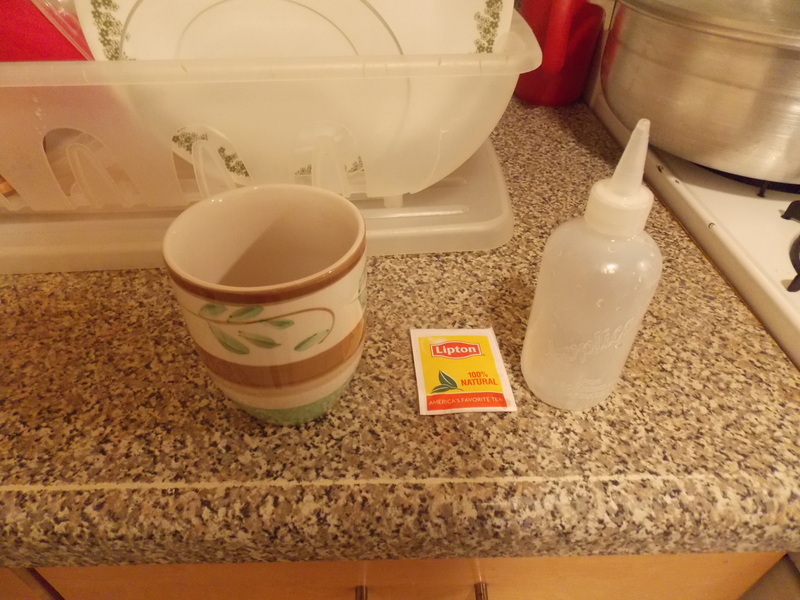 Once your tea has brewed, all you have to do is place the mixture in the applicator. There are several varieties of applicators, like ones with longer nozzles for thicker hair and ones with slanted nozzles for hard to reach spots. My applicator is standard, but works just the same. You can purchase applicators at your local beauty supply store for around a dollar! They are great tools to have around for hot oil treatments and deep cleanses. Step Three: Rinse Yo Scalp! Squirt the mixture into your scalp and massage in. Be thorough. Make sure you cover your entire scalp. Grab a plastic cap and leave the mix in your head for 5-20 minutes. Rinse afterwards and continue your normal routine. I co-wash my hair so after co-washing, I just styled as normal. I do not have an after picture of my hair only because this recommended to be a continuous treatment. I’ll probably have an after picture when I do an update on the progress of the tea rinse. I left my tea in for 5 minutes, during which time I massaged my scalp. I noticed that the tea rinse surprisingly picked up a lot of film from my scalp, so it was actually working as a cleanser as well, which was pretty awesome. 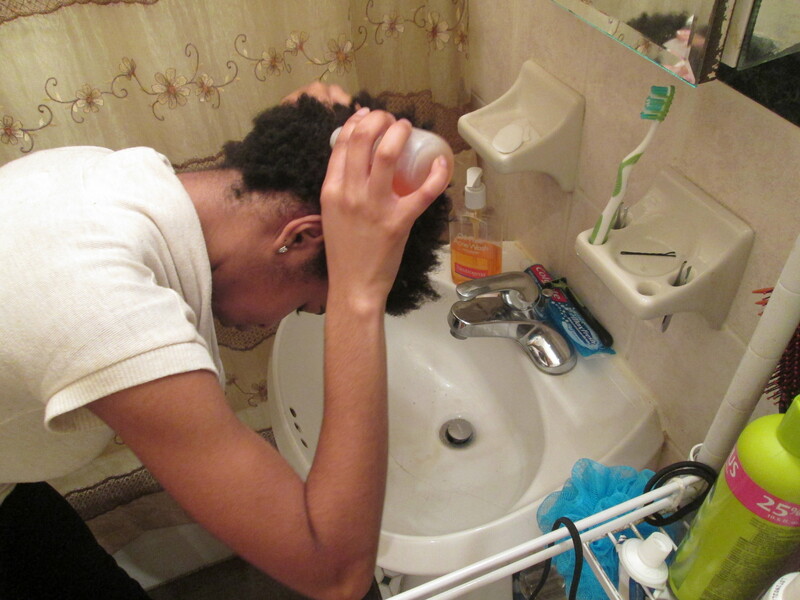 As for my personal results, I noticed when I started to co-wash that my hair was springier and bouncier. Also, when I washed out my conditioner, my hair looked even cleaner than it usually does. The one thing I must say is that my hair doesn’t smell as great as it normally does when I just co-wash ans style as normal. I can deal with that if it’s only once a month though, that’s not such a big deal. Overall, I don’t have much to go on as of yet because it’s all so new and my hair isn’t used to it but I’m very optimistic. I can’t wait to see my hair growth after 2-3 more treatments. Cool. I’d be curious to know how this works! Me too! I can’t wait to share.